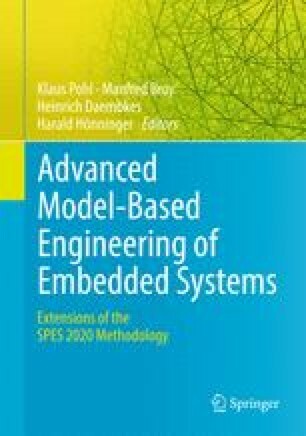 The SPES XT modeling framework allows seamless, model-based development of complex embedded systems. While the SPEX XT modeling framework is defined on a coceptual level, a technical realization is required for industrial success. [Birken 2015] K. Birken: Franca User Guide. https://franca.eclipselabs.org.codespot.com/files/FrancaUserGuide-0.3.0.pdf. ( Accessed October 6, 2015). [Johnson and Speicher 2013] D. Johnson, S. Speicher: Open Services for Lifecycle Collaboration - Core Specification Version 2.0. http://open­services.net/bin/view/Main/OslcCoreSpecification. (Accessed October 6, 2015).